In 1956, KETC-TV from St Louis, Missouri brought 1200 children to tour Mark Twain points of interest. The Hannibal Chamber of Commerce announced that they would sponsor a contest amongst the seventh grade students in Hannibal to portray Tom Sawyer and Becky Thatcher in conjunction with this visit. Little did they know at the time that the Tom and Becky program would continue more than 50 years later. The contest consisted of each school in Hannibal selecting one boy and one girl from the seventh grade to participate in the contest. The first committee from the Hannibal Chamber consisted of George Pace (chairman of the Chamber Tourist Development Committee), Woodrow Moore, A. G. Barnett, and Robert Welch. Members of the Missouri Press Association, the Mark Twain Research Foundation, and the Missouri Historical Society performed final judging. They were chosen based on illustrations from the first edition of Tom Sawyer and the Gilded Age. Decisions were made from costumes, personification, and personality. Final judging was held the morning of the tour. On May 5, 1956, Hannibal crowned its first Tom Sawyer and Becky Thatcher, Chris Winkler and Perva Lou Smith, in front of 1,200 St. Louis children. Thus began a program designed to have young people from Hannibal to serve as ambassadors for Hannibal and the tourist industry. Prior to the announcement, word of the event reached Walt Disney. 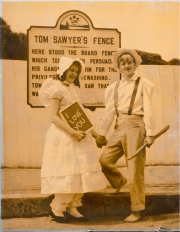 Coincidently, Mr. Disney was opening Tom Sawyer Island at Disneyland in June of that year and an invitation was extended to the winners of the Tom and Becky contest to participate in opening ceremonies. The program became a yearly event. As word of the program spread so did the opportunities to be ambassadors grow. Tom’s and Becky’s have participated in parades not only locally, but nationally as well. They have made appearances in California, Washington, D.C., Florida, New York, Minnesota, Iowa, Kentucky, Pennsylvania, Texas, Arizona, Kansas, Ohio, Tennessee, Illinois and of course the state of Missouri over the years. They have visited Japan (twice), Canada (twice), and Mexico. They have made appearances at schools, libraries, ground breaking ceremonies, conventions, tour buses, ribbon cuttings, festivals, riverboat dockings, local functions, civic groups, state fairs, county fairs, etc. During the summer on Friday and Saturday you can see Tom and Becky strolling in the Mark Twain Historic District. They have greeted presidents, vice presidents, first ladies, and governors. They have had their pictures in magazines and newspapers around the world. They have been in movies, travel films, and on TV news programs throughout the United States. Each year Tom and Becky travel to locations such as the Calaveras County, California and Hartord, Connecticut to promote Hannibal and keep Mark Twain’s characters alive. Over the years the selection process has changed. It began with the schools selecting representatives from their school to participate and then they had personal interviews before a panel of judges usually the morning of the announcement. Orientation was added to the program in 1981. The two Saturdays before the 4th of July announcement, the contestants toured the historic district and attractions. Also added was a 20 question written test on Hannibal and Mark Twain. Final judging was held on July 3rd and the announcement followed the Hannibal Chamber sponsored frog jump. In 1987 contestants the test format was changed to 20 questions with written answers and 10 questions with true or false answers. 1992 brought changes to the contest, some of which are still being used today. The contest was opened to all 7th grade students who lived in the Hannibal Public School District. 100 students applied that year. Teachers then narrowed the field to 40 students who prepared a speech. These speeches were performed before a panel of judges who again narrowed it to 20. Contestants took a written test on Mark Twain and Hannibal and had personal interviews before a panel of judges. This panel narrowed the field to 5 boys and 5 girls. An orientation period and final judging followed this selection. The final judges selected the official Tom and Becky. Present day the contest runs from February to July 4th each year. Invitations are still sent to all seventh grade students residing in the Hannibal Public School District and home school students are also encouraged to participate. Throughout the selection process three informational meetings are conducted. Interested students sign up through their school or at the chamber office. Their teachers then evaluate the students on interpersonal skills, scholastic standing, citizenship, and responsibility. Students then present to a panel of 11 judges a short speech on why they would like to be a Tom or Becky. Judges select 12 boys and 12 girls to move on to the semi-finals. The contestants then take a written test on Mark Twain and Hannibal and had personal interviews before a panel of judges. This panel narrows the field to 5 boys and 5 girls. Contestants prepare their costumes and participate in a 2-day orientation period where three judges observe them to see how they interact with each other and visiting tourist, aptitude for the job, manners, and their ability to portray the character, items in their bags, the engagement scene, and costume. On July 3rd, three out of town judges observe the contestants in the historic district during the morning and in the afternoon they conduct personal interviews of all 10 finalists. The cumulative score from the test, interview, orientation and final judging is used to select the official Tom and Becky. In 2015, stewardship of the Tom and Becky Program was transferred to the Mark Twain Boyhood Home and Museum where the program has found it’s current home. You can follow Tom and Becky and all their appearance through the year on Facebook at The Tom and Becky Program.